Founded in 1878 as "The Western University of London Ontario," our University remained relatively small during its early years before experiencing rapid growth and development following World War II. By 1956, Western's President, Edward Hall, was challenging his colleagues to aim higher, "to think in terms of this university becoming the greatest university in Canada." The campus community responded, and Western has since evolved into a teaching and research leader. With an enviable national reputation, and an expanding international profile, Western today ranks among the top 1% of higher education institutions world-wide. It is a founding member of the U-15 (Canada's group of leading research universities), serves as a hub for more than 500 international research collaborations, and is recognized as one of Canada's Top 100 Employers. Guided by its institutional motto, Veritas et Utilitas, Western is devoted to both the search for truth and the application of knowledge. Its faculty, staff, librarians, archivists, postdoctoral scholars, students and alumni have changed the world. 2013: Former Western student, Writer-in-Residence, and honorary degree recipient Alice Munro becomes the first Canadian woman to win the Nobel Prize in Literature. We are proud of this record of individual and collective achievement. 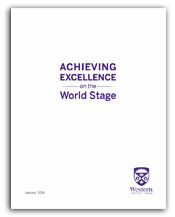 As it continues to add entries from the full range of established and emergent academic disciplines, Western's institutional self-confidence and global reputation will grow with it. Our shared history demonstrates that Western's past and future achievements are limited only by the imagination, expertise, and aspiration of its greatest asset: its people. In the decades since President Hall challenged us to think big, the campus community has responded and evolved. Today, we welcome approximately 5,000 first-year undergraduate students each year to our extraordinarily beautiful residential campus. As social demand for access to university education has grown, Western's enrolment has expanded to meet the need for global-ready citizens educated to compete in today's knowledge-based economy. Western's unique physical infrastructure, welcoming local community, tremendous faculty and staff, vibrant academic programs, and wide range of support services attract the brightest students from across Canada and around the world.